Finally… since it is a bit cooler up here in the Hudson Valley, tomato season has just arrived and with a flourish. Last year all of my carefully planted and tended plants turned black and were subject to the tomato blight. Sadly, no tomatoes. But this year is making up for it. Every day I have a basketful of new shapes and colors. And every day there is the struggle to get out there and pick them before the rest of the animal population does. Unfortunately, the animals love the heirloom ones as much as I do. 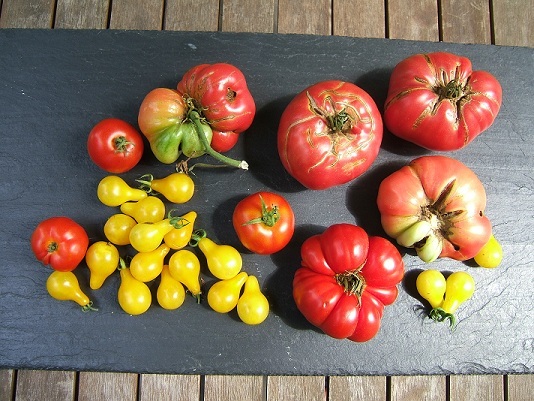 So alas, they are the first to hit the ground with only half of each tomato consumed….I wonder…do they get bored, full or just want to heckle me!! So sad. So what to do with all my tomatoes? Make friends and drop off tomato-filled sacks to your favorite neighbors or perhaps to people who have helped you out during the past year. I have some elderly friends who do not have a vegetable garden and who are on a tight budget (who isn’t?) so it is always a pleasure to see their eyes light up when I drop off my bounty of tomatoes. Does more for me than for my neighbors. My gift to you is a couple of recipes that, I hope, will appeal to you during this abundant summer of tomato jewels. No cooking required. 1. Arrange tomatoes, overlapping them slightly on a platter. 2. Drizzle with oil and balsamic glaze; then sprinkle with remaining ingredients. 3. Serve at room temperature. 1. Toss together all ingredients in a serving bowl. Note: add some chopped avocado for a flavor twist. Who doesn't like tomatoes?! Thank you very much for sharing those recipes! Will note them down and try them during tomato season!